Hope you've all had a good week...especially any of my East Coast friends who may have experience the snow-mageddon known as "Juno"...hope you're all warm and toasty! 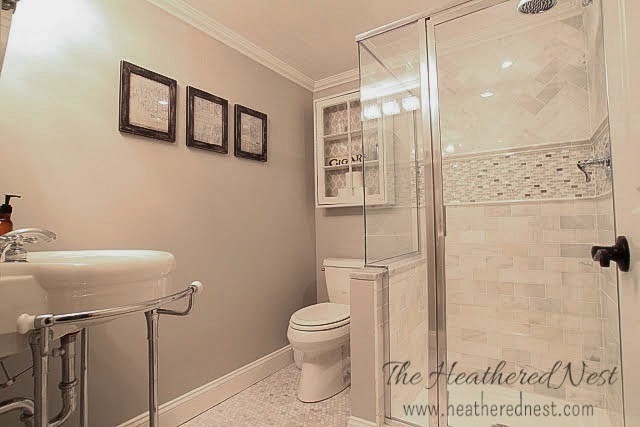 For this week's Frugal Round-Up I wanted to share this FAB.U.LOUS bathroom makeover that was linked up by The Heathered Nest. Seriously folks! This is an awesome before and after! Next, check out this darling blanket trunk makeover shared by NorthShore Days. So fun and beachy! You are the sweetest, Wendy. Thank you :) And I cannot wait to get a copy of American Farmhouse Style!! A big, and well deserved Congratulations!! First time to your blog. Thanks for hosting a fun party. I have enjoyed seeing some amazing projects, recipes and tips. Have a wonderful weekend. Hey, Wendy! Thanks for the party, Love the beach blanket box!